I love stamps, inks, making cards. Above all, I love my Lord!! YAY!! Finally, I made it to the Gallery Idol Top 5. I still can’t believe that my card is on the posted wall for the Gallery Idol Top 5. Thank you from the bottom of my heart everyone!! NOW…. It is time to show you my card for the Final round! Here it is: I named it ‘GARDEN HEAVEN’. The theme for round 5 is ‘ADHESIVES‘. Adhesives… adhesives… I counted double-sided bonding tape, foam adhesive, any types of glue, and glossy accents. Am I right? My card looks nothing special… just made with ordinary way… but, my aim for this round was to show you a conventional card with its own unique idea. I chose several colours of ‘Martha Stewart Glitter Powder’ for the background and ‘Summer Garden stamps by Simon Says Stamp’ as embellishments. I LOVE Summer Garden stamps very much. It is so adorable! So, I was really happy that I could use these stamps for my last challenge card LOL!! I affixed a double-sided sticky tape on the paper at first and then I die cut using MFT Die-namics Triangle Screen as a garden wall hangings. I then gently rubbed on glitter powder on the sticky part of the paper. Rainbow colours were chose from Martha Glitter Powders. They are super-duper fine and I love them all. 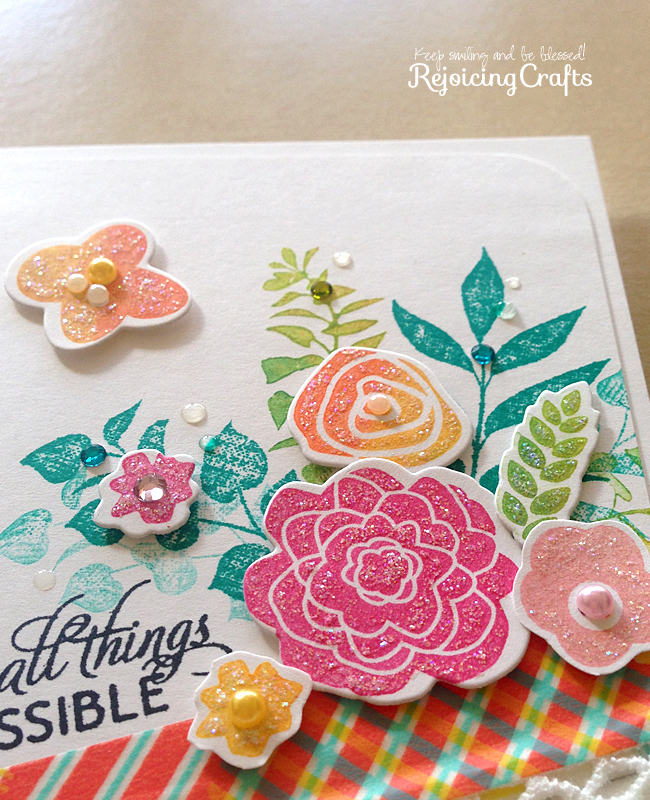 My second form of adhesives – and this is my favourite types of adhesives – is Glossy Accents! I used it to make watercolour flowers more fancy. Wow… this is already my last card for Gallery Idol contest 2014. I’m so happy and highly honoured… because I can meet many fabulous ladies in the top 20. Their works is AMAZING and I respect them all. 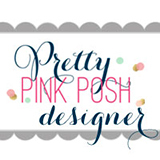 Thank you Paper Crafts & Scrapbooking Magazine for choosing me. I’ve learnt a lot and am still learning from all fabulous cards. It is definitely wonderful journey that can’t be replaced with any prizes!! Keep smiling and be blessed! God bless you all! Happy Monday!! Did you have a wonderful weekend? Yes I did! Because… I made it to the Gallery Idol Top 10. Hooray~~ I spent a very happy weekend making card for next round. LOL!! Wow… with each round, the task is getting more difficult and very tricky as well. The theme for round 4 is ‘BORDER STAMPS‘ and I – honestly and seriously – just have one border stamp set. OMGoodness!!! When you look at this card, what is the first thing that come to your mind? Passion, classy, rose, frills, and beautiful Red & Black… Let’s dance Flamenco! I named it ‘Flamenco Fantasy‘ and You are my greatest joy!! I wanted to express gorgeous red long dress, beautiful red rose using lace border stamps, and happy dancing moment through paper frills. It was so great moment and the greatest joy. I heat embossed music background stamp in clear on the black card base at first. I then blended with several reddish colours of Distress Inks on the watercolour paper. After red watercolour paper was completely dried, I carefully stamped chosen border stamps in black and added shiny effect using Clear Zig Wink of Stella Glitter Brush. For sentiment, I aligned it along with lace borders. To make it stand out, I stamped in Frost white on the black banner. Thank you so much for your support and prayer! Keep smiling and be blessed! Happy Monday Again!! YAY~ I made it to the Gallery Idol Top 15. I am highly honoured and so excited. For GI round 3, I chose a gorgeous ‘PUNCTUATION Stencil’ by Simon Says Stamp and I named this card ‘Sound of Music‘. Sound of Music… So, shall we dance? You are absolutely delightful!! Happy Monday!! I am highly honoured to be a part of the Top 20 at Gallery Idol. Honestly, I cut each one of all my dies and arranged all die cuts on the desk! Thinking… thinking… thinking… I was thinking what I was going to make over and over again. Oh!! I hit on the best idea all of a sudden! ‘BRIDE OF MAY‘ LOL!! I chose lovely Spellbinders In’spire Die-Silhouette, Clearly Besotted Fancy Feathers Die Collection, and Clearly Besotted Love Word Die. My focal point is ‘LOVE WORD’ die cut. Normally I use stamps when I decorate a card with sentiment but, for round two, I wanted to carry out my duties faithfully. Extremely fine day in May and… this card is for all Brides of May! 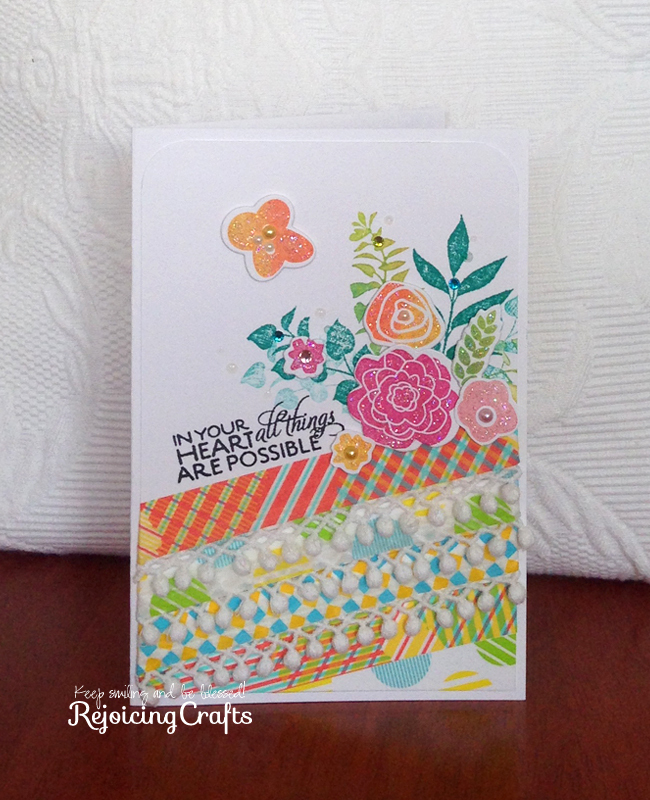 I made ‘GET WELL’ card with gorgeous Papertrey ink bigger blossoms stamp set and I adore the cute flower stamps. I used many floral colour pigment ink pads for these cute blossoms and especially Studio Calico Color Theory Ink Emerald City for leaves. 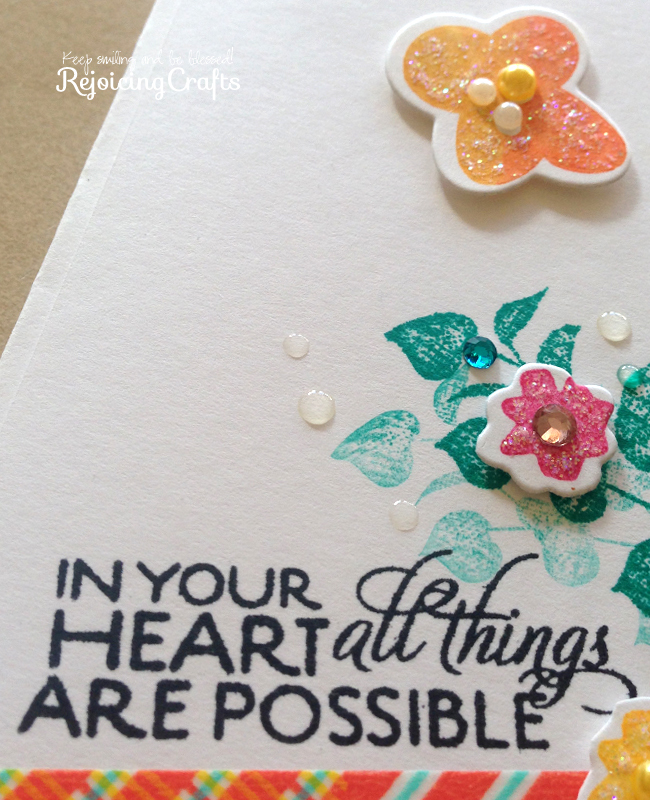 “IN YOUR HEART ALL THINGS ARE POSSIBLE!” YES! WE CAN DO! !